Holidays in Costa Teguise start with a convenient taxi transfer of approximately 20 minutes from Arrecife airport, this modern beach resort lies on the east coast in the central part of Lanzarote. Costa Teguise is one of Lanzarote's major tourists resorts, it is purpose built, with a only a few older buildings and provides a good base for your Lanzarote holiday. The resort has an enviable variety of accommodation from modest self catering studios and apartments through to high end luxury 4 and 5 star hotels. Visitors will also appreciate the wide variety of cafes, pubs, bars, shops and restaurants available here. Holidays to Costa Teguise are popular with families and young couples, a great choice for those that enjoy a holiday mixture of a relaxing beach and some lively and enjoyable nightlife. The bars and restaurants in the resort offer a choice of both British and local style and are scattered throughout the resort ideal for those looking for a night out without all the hustle and bustle! There is no shortage of shops in the resort, jewellers, general gift shops and discount electrical stores are also very popular. 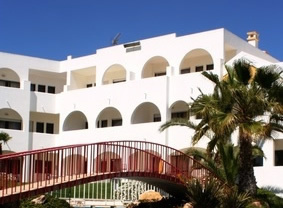 If you are thinking of a self catering holiday there are plenty of supermarkets within the resort and eating out is very easy with plenty of restaurants providing a wide range of cuisine such as Indian, Chinese and International fare. Costa Teguise is renowned for its windsurfing and enjoys generally good weather all year round, the somewhat windier conditions prevalent here that suit windsurfers can also be a boon to the beach lovers and sunbathers helping them to stay cool in the height of summer. The resort is also the home of the islands challenging golf course. Costa Teguise is also home to the not to be missed Aquapark a fun filled water park. Costa Teguise is well served with public transport, buses and taxis are readily available throughout the resort. However, if you want to explore Lanzarote further and the attractions further afield you may wish to consider renting a car. Please call any of our travel advisors for a quote. Travel Empire's favourite bar in Costa Teguise; The Sunburnt Arms, good bar, brilliant name!